Today at theproblemwithlife is epistemology day. I’ve been reading a fair bit about quantum mechanics, and specifically the measurement problem lately, which has brought up a lot of ideas I was engaged with when I was studying philosophy, particularly with regard to how we can know what we know. The essential problem is simple: we cannot rely on our subjective view of the world around us. As Descartes pointed out, our senses are easily fooled. If you put a pen in a glass of water it appears to bend. I am short-sighted, what I see as a blurry colour in the distance is really a person. More recently, physicists are steadily more convinced that we don’t experience the majority of what makes up the universe – hence the enormous sums being spent on discovering ‘dark matter’. 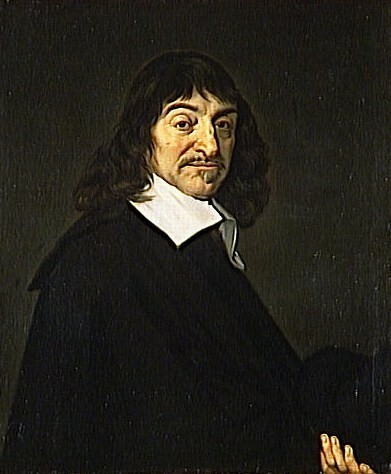 However, as Descartes also demonstrated, subjectivity is all we’ve got, and we can rely on it to a certain extent. The fact that I am thinking means that I must exist. “I think, therefore I am”. What he was less successful at was showing that this could extrapolate into an objective knowledge of the world-as-it-is. Husserl‘s solution was to ‘bracket’ the problem: our subjective experience of the world at large does not necessarily correlate with what is there, but we do know that what we are experiencing is correct in our experience. Whether it correlates with what is ‘really’ there is irrelevant. This conclusion is an uncomfortable pill to swallow and is essentially brushing an enormous problem under a very thick carpet. However, he has a point. We can rely on subjective experience insofar as we know that our experience exists, because we are having it. As the only verifiable source of information, it is correct. Whether it correlates with an abstract concept of ‘reality’ is another matter, and one that cannot be verified. This train of thought has led some to assert that subjectivity is the only reality, and that there is no such thing as an objective reality. This can lead to solipsism, which although not a logically inconsistent position, is not one anyone truly wants to retreat to. Similarly, denying the existence of an objective reality seems to me to be an enormous arrogance on the part of homo sapiens. This does leave us in a position of faith concerning the existence of a world beyond our perception, but that is the best we have for now. However, there is a case to be made for the accuracy of a multitude of subjectivities. If every subjective experience is correct insofar as it exists, but it may be subject to error since we cannot rely on our senses (nor our interpretation of sense information), then combined, probability dictates that the rate of error should decrease, since over a large number of subjectivities different errors should be experienced. Taken together, the errors will be marginalised. This is the principle of crowdsourcing. It is on this premise that most of our beliefs are based. I believe that the objective world exists because almost everyone else in the world (to the best of my knowledge) does as well. It is a common experience that it exists. Within the limitations of our physiology, this can lead to some very accurate conclusions. Of course, it can also lead to some stunningly inaccurate conclusions: that the sun revolves around the Earth for example, that homosexuality is wrong, or that George Bush should be President. This is where time should be taken into account. Just as it may seem that there is a huge movement of people who believe Justin Bieber makes good records, he will be forgotten about in little over two years (I’m taking bets), whereas The Beatles still attract enormous record sales, and in all likelihood will continue to do so. It is evident that crowdsourcing can produce enormous errors of interpretation but if knowledge is taken as a four dimensional entity errors are once again marginalised. And on a purely ontological level, crowdsourcing is the most accurate measurement device we have. Without it, all we’ve got is what’s going on in our heads. The problem with life is…no one knows what’s really out there. I’m interested in your citing “homosexuality is wrong” as an inaccurate conclusion. How can you say that a moral stance is accurate or inaccurate? Surely morality is always inherently subjective? True, you can’t. In fact, all of the examples I give are more or less subjective. Although I choose to believe in science as far more verifiable than religion, that the sun revolved around the Earth was as self-evidently obvious in pre-Copernican times as the reverse is now. Given our only knowledge is subjective, and ‘objectivity’ is conveyed through mass subjectivity (crowdsourcing) all our knowledge is subjective to an extent. Morality is a particularly temporal example and values shift over time, something I plan on looking at in a future post.